The writer who chooses memoir as a medium faces a daunting challenge: to ground himself in the personal—in a specific, unique, individual life—and somehow open back out into the world of larger human experience, where readers live. For the writers of an illness memoir, the challenge is further compounded. For one, the experience of being seriously ill rarely comes with an in-built sense of perspective. In fact, illness often seems to actively resist perspective, if not destroy it, knocking the body out of sync with its normal rhythm, exhausting the cognitive properties necessary for description and understanding. A writer with a serious illness, wishing to convey the truth of his lived experience, cannot avoid the bodily reality of that illness, or its effect on his life; neither can they readily express the pain of that experience to another person. Though the illness may loom conspicuously large in the life of the writer, the experience does not easily translate; in the mind of a reader, the writer’s pain might as well exist in another dimension, another universe. You inherit a new, small universe with every catastrophe. But when the catastrophe is illness, it’s your universe to steward, and it’s already half-complete by the time you get it. Diagnoses, complications, final outcomes—those are rarely yours to fully mold. So you’re appointed your illness’ middle manager, its parking lot attendant, responsible for arranging people properly in its orbit. For his part, Scalise is a masterful arranger, crafting a narrative that leaves the reader feeling lucky to have been positioned so skillfully. As in many of the best illness memoirs, Scalise overcomes the odds stacked against him—not the least of which is that the majority of readers may not have ever even heard of his particular disorder—through an incredible driving desire to share his experience, to try to understand it and learn from it alongside his readers. The Brand New Catastrophe is ostensibly about Scalise’s experience with acromegaly, an incredibly rare hormonal disorder—shared in one form with Andre “The Giant” Roussimoff, he of pro wrestling, Princess Bride, and propaganda fame (OBEY)—in which a tumor on the pituitary gland releases constant streams of HGH into the body. Undiscovered and untreated, acromegaly can cause a host of complications, including bone thickening which often leads to physical deformities. Acromegaly is usually discovered in late adulthood, but Scalise’s acromegaly was diagnosed early, at age 24, when a tumor unexpectedly burst inside his head—the titular catastrophic event which sets off Scalise’s narrative; though Scalise’s own physical features remained relatively untouched, he was left with a body unable to produce hormones in the fallout. If The Brand New Catastrophe were only an illness memoir, it would still be well worth the read; Scalise’s account of the disorder—including fascinating descriptions of the medicine treating it—is simultaneously complex and accessible, altogether vivid. For instance, at one point he describes the sensation of having excess spinal fluid released by nurses as being “like letting loose a soul-deep sneeze.” In another passage, his heartbeat becomes “a tightened metronome, a foreign, rapid glug.” Throughout, Scalise paints an impossible-to-comprehend experience with a steady brush, in strokes both hilarious and heartbreaking, beautiful and grotesque, defiant and humble, angry at times but always unfailingly generous. It seems that he comes by the latter trait honestly: Scalise’s intimate personal account is full of deep, colorful characters, including Scalise’s patient friends and family. The Brand New Catastrophe may be situated squarely within the realm of illness memoir, but it is also very much the story of a family, of a son trying to understand his mother’s own incomprehensible experience with chronic heart disease, of a husband struggling along with his wife to find a new normal in a world now full of uncertain experimental treatments and fake hormone injections. Scalise’s relationships with those closest to him provide access to the warm human core of a narrative that could easily have been bitter and cold; as a reader, that access is a welcome gift. 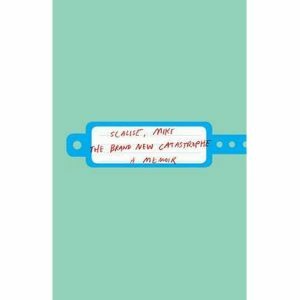 In the end, The Brand New Catastrophe is a stunning, unforgettable memoir; a masterfully intimate and honest portrayal of a writer who has fought hard for perspective amidst the shattering impact of illness, struggling for self-definition and control in the face of chaos. Above all, it is the work of a writer deeply concerned with connecting to his readers and deftly bridging the significant gap that illness places between them, with humor, humility, and grace. Andrew Cartwright is a nonfiction editor for phoebe. He writes and studies creative nonfiction in the MFA program at George Mason University in Virginia. His work has appeared in Esquire Ukraine and Word Riot. Follow him on Twitter @ACart77.